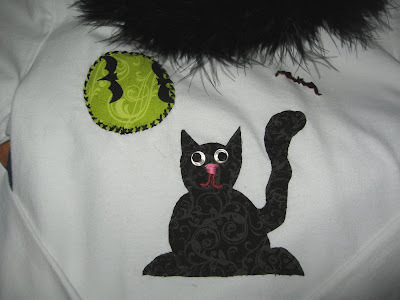 Boston Handmade: Salem, Ma... Halloween... And Learning a New Craft! Salem, Ma... Halloween... And Learning a New Craft! October is a great time to be living in Salem, MA. We celebrate Halloween all month long here - thousands of people migrate to Salem to participate in Haunted Happenings... to hear about the famous Witch Trials and simply have fun getting caught up in all the hype of the season. I digress a little though. 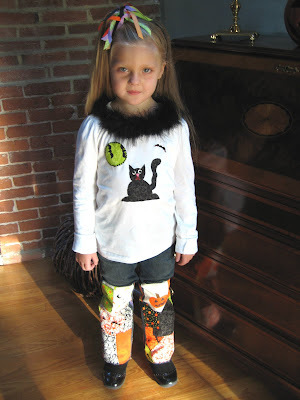 Ever since I have been in the "handmade" environment - I have been so impressed with all the artists who design children's clothes. I love that one-of-a-kind boutique look that you can't buy in stores. A particular design caught my eye - decoupaging with fabric. 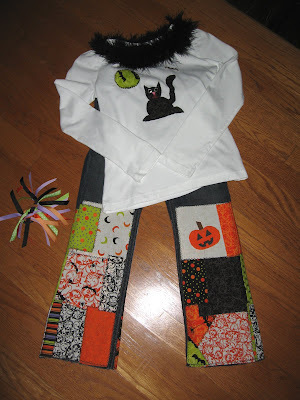 I wanted to learn how to do this... however, the sewing machine scares the daylights out of me... I can sit through any horror movie you put in front of me and not flinch - but stick sewing machine in my face and I start screaming... running for the door. I am not sure why I have never taken up this craft... My grandmother was a top notch seamstress and by the third grade my mother was able to make her own dress that she then wore to a recital... so... why wasn't that gene passed onto me?!? 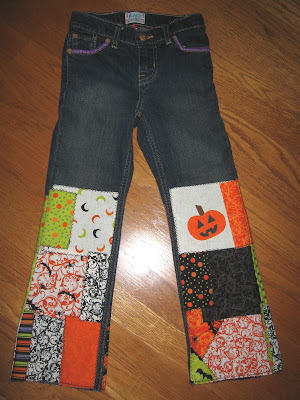 Well - I was doing some fabric hunting and found the cutest Halloween fabric square pack by Moda. I did a little research on decoupaging clothing and I was off. Will all the supplies I needed I made a go at it. 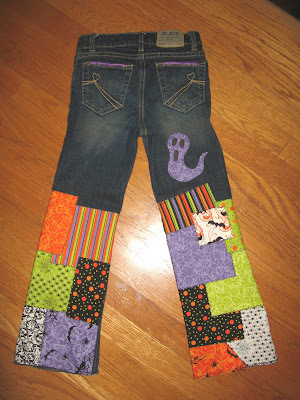 My mother was able to help with sewing the edges of the fabric on the jeans... and presto! I completed my first boutique outfit for my daughter! I am hooked... I now know why these are sold for so much as it took me about four days to complete. I even hand embroidered on the jeans and the shirt! Devan wore the outfit to school today and got a lot of ooohs and aaaahhs... and when she was asked where she got it - she simply said... "My mom made it" and though small... I really felt proud of my accomplishment. Wow! Those are adorable! Good for you Marla, to tame that sewing machine!